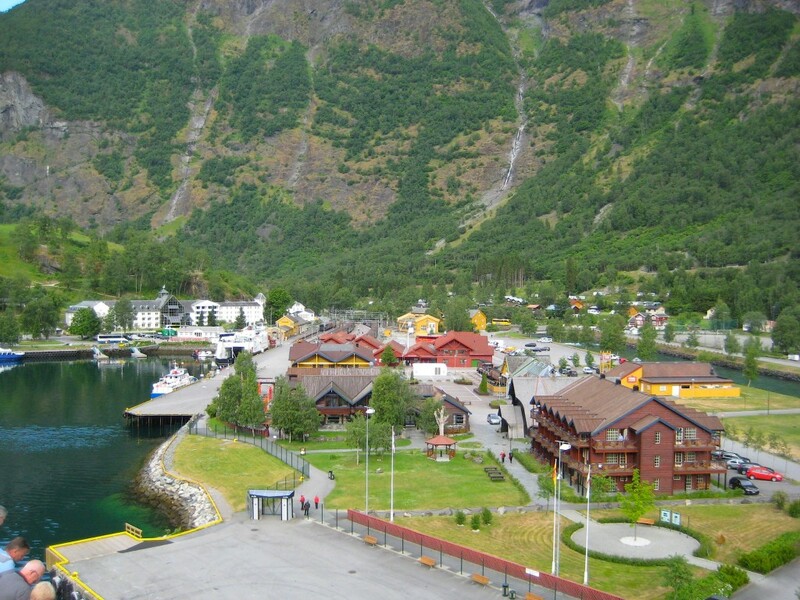 Flam is a very picturesque village located several hours from the open sea at the end of an extension of the Sognefjord, the Aurlandsfjord. 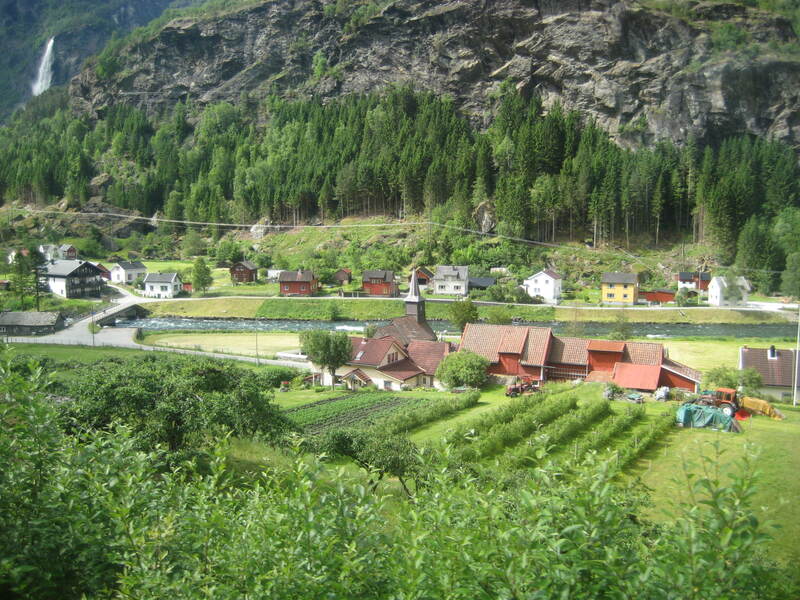 The name of the village means “little place between steep mountains” which is exactly what you find at Flam. Snow-capped mountains surround the harbor. It is a popular holiday destination for hiking, fishing and biking. Our shore excursion took us on the Flam Railway dating back to 1940 when this section of the railroad was finally completed after twenty years of construction. It was a major challenge for railway engineers of the period due to the fact that 80% of the line has a gradient of 55%, the equivalent of 1:18. In addition to the steep grade, a total of 20 tunnels exist — 4.5 miles in length– and 18 required to be hand dug. 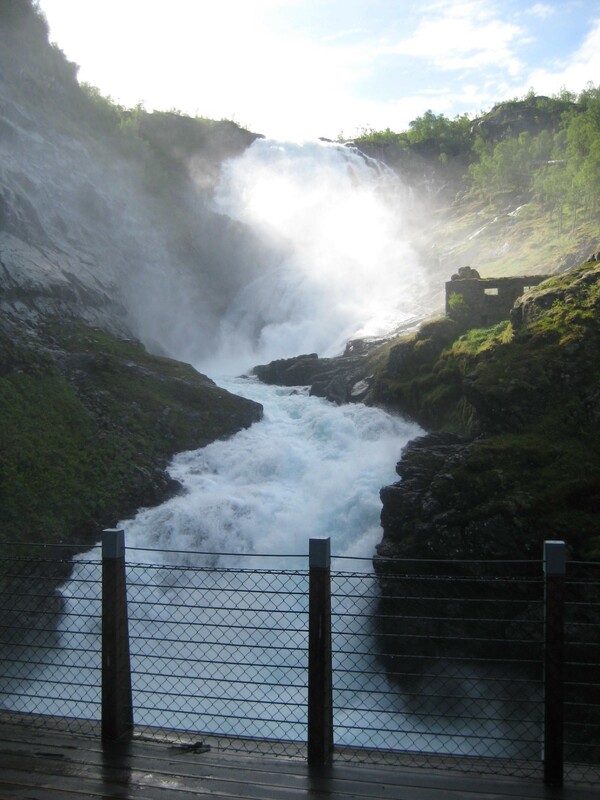 The result is a spectacularly beautiful train journey providing panoramic views of the Norwegian mountains and valleys. Waterfalls cascade down the mountains into the river below. We saw fruit orchards, sheep grazing and goat farming for cheese production along the way. The train stopped along the way for a photo stop of one of the largest waterfalls in this area. When we reached our destination at Vatna-Halsen we disembarked the train for waffles and coffee at the local hotel. Some free time allowed us to wander out into the beautiful countryside to explore some of spring’s wildflowers, a local lake and to look for Trolls. Unfortunately as we have learned the trolls only come out at night so we were not lucky enough to spot any Trolls. We returned to Flam via the railway where we explored the Flam Railroad Museum to gain more insight into the construction and history of the local railroad. In Flam we wandered the small village, which consists of a hotel, market, visitors center and a variety of large souvenir shops selling trolls and other Norwegian items. No wifi internet sites were to be found……lots of frustrated people, or at least us! The entertainer on this night was Petrina Johnson a star of the BBC television series “Showstoppers” and has also performed in London musicals like Sunset Boulevard, Copacabana and Evita. We had enjoyed her voice on the world cruise last year and she was excellent this night as well.